Is not that I am so passionate about bread that I cannot move around without having a bite every now and then, is just that fresh baked bread is annoyingly tempting and as soon as I get started on eating, is very difficult to stop. I find myself making all sorts of weird combinations with other various food items because in the end, everything works with hot bread fresh coming out of the oven. For a long time I was stuck on those soft pretzels that you can usually find at the mall. I actually abused a couple of recipes, until I was finally done and never looked at pretzels the same way since. I cannot say the same thing about chocolate, this is my all time real addiction from which there doesn’t seem to be any escape, is like I was a woman in some previous life (WHAAAAAT!). But let me get back to today’s recipe, bread knots with butter and basil that go amazingly well with, you guessed it… chocolate (duh!). Well, not really! That was supposed to be a joke. Probably if you don’t use basil and garlic but that takes all the fun out of it but you could always swap that for bacon, another personal favorite. The thing is, they are so easy to make and so fast is not even worth having any other kind of bread on your table, especially not something store bough, but if you don’t believe me, give it a shot and you will see. Enjoy! In a bowl mix yeast, sugar and warm water. Stir and let sit for 10 minutes until yeast becomes frothy. In the bowl of your mixer, mix the flour and salt together. Add egg, butter and yeast mixture. Mix using paddle attachment until it's all well incorporated. The dough will be a bit soft. Place the dough into a well oiled bowl, cover up with plastic wrap and let sit until doubled in size, about 1 to 2 hours. After dough doubled in size, preheat oven to 400° F / 205° C. Cover baking sheet with parchment paper. Punch down dough and knead it a bit, then cut the dough into 15 pieces. Roll each piece into long ropes about 15 inches and form into knots and place on baking sheet. Mix the butter ingredients together and brush over knots. Let knots rest for another 10 minutes then bake for 9 to 12 minutes or until golden. 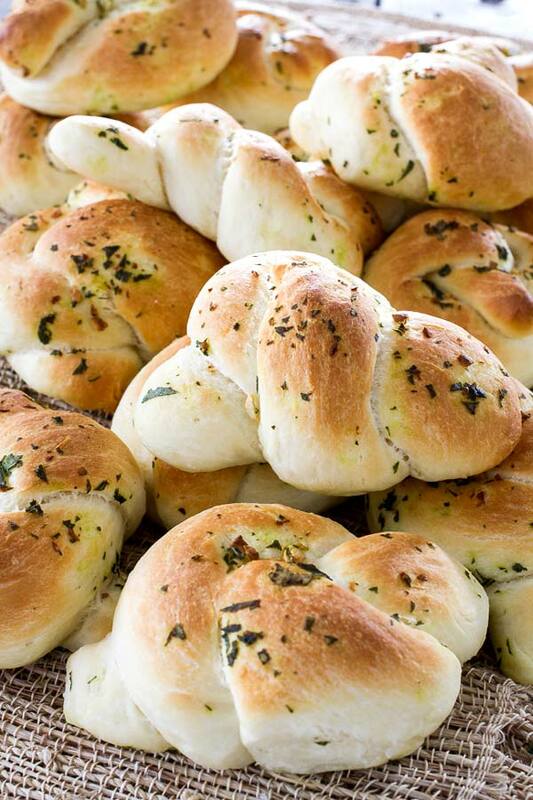 If there's any garlic basil butter left, brush again on knots before serving and yell YUMMM!